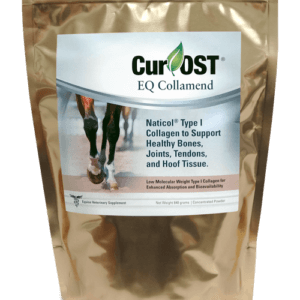 Cur-OST EQ Total Support Provides Joint, Tendon, Digestive, Hoof, Allergy, and Whole Body Inflammation Support Targeting the Easy-Keeper Horse. 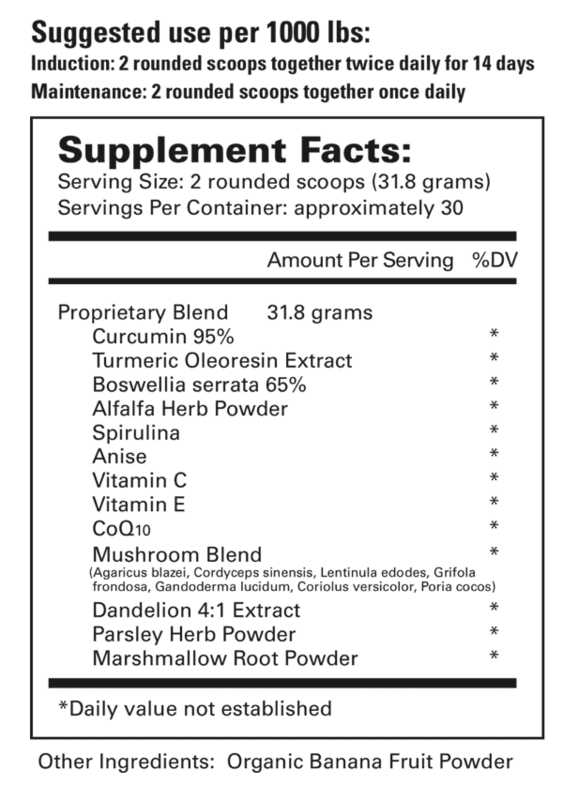 Control Allergies And Target Digestive Health. 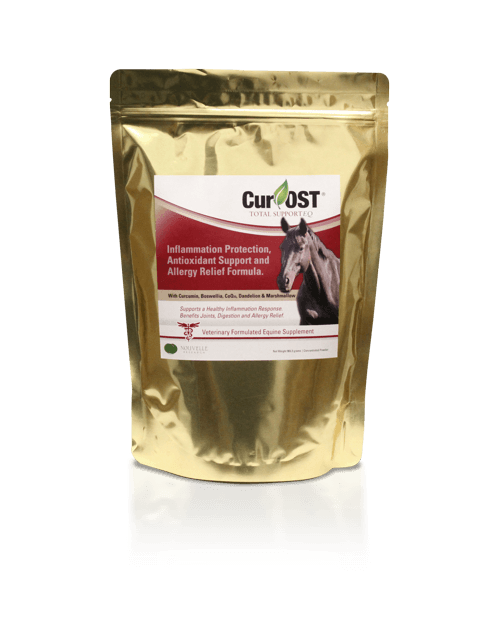 Targets joint health, tendon recovery, hoof health, skin, eye, respiratory and other allergic conditions in the easy keeper type with underlying gastrointestinal dysfunction. Our most popular formula for the easy keeper type to balance inflammation! Many equine health and lameness conditions are associated with poor digestive health and leaky gut syndrome, contributing to unhealthy levels of inflammation and a poor immune response. EQ Total Support targets many equine conditions associated with high levels of inflammation and pain while enhancing digestion, helping to also improve joints, mobility and tendon health. Ideal horse supplement for equine allergies, joint ailments and tendon conditions that might be associated with poor digestive ability and chronic inflammation in the easy-keeper or stocky horse. Inflammatory problems with metabolic syndrome, insulin dysregulation or Cushing’s syndrome? Allergy symptoms or respiratory conditions with discharge, coughing, redness or itching? Poor hoof or tendon health, with an ‘easy keeper’ body condition, metabolic or digestive issues? Overall metabolic complaints or Cushing’ syndrome? Stomach ulcers or digestive complaints? Behavioral problems that may be attributed to digestive problems? Persistent laminitis problems associated with metabolic conditions? 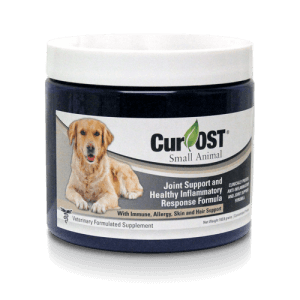 The Cur-OST EQ Total Support formula was originally designed and intended for the management of equine allergies and respiratory conditions, but the benefits are much further reaching! We have found this formula to be very beneficial in torn tendons, ligaments, hoof and joint conditions where there may be underlying digestive deficiencies. Multiple benefits have also been seen in cases of Metabolic Syndrome and Insulin Resistance with concurrent laminitis. Please contact Dr. Schell directly with any questions that you might have about our Cur-OST Equine formulas by clicking the ‘Orange’ button at the top of the page. You may also view our equine product article HERE, which may help you in decifering which product is correct. We are also here to assist you by phone by calling 1-800-476-4702. Started this product on my horse with COPD, after the first month, I can’t believe the difference! In combination with Immune, I have eliminated the use of allergy shots, as well as aides etc. Not only is my mare feeling and breathing great, she looks incredible! 5 stars for sure, this has saved my mare’s performance career. My Equine Metabolic Mare is so much healthier now. Her weight is stabilized, she has more energy, and her hooves improve with each trim. Perhaps the best indicator EQ Total is ideal for EMS/IR horses is the slow disappearance of a very hard and thick crest. The crest is now soft and malleable indicating the fat is breaking down. Well done Cur-OST! The EQ Total Support has been instrumental in restoring my horse’s health. For several years we have tried to manage allergies and other respiratory issues and were unable to do so effectively. Once they snowballed out of control, we had a very serious case of respiratory distress and sought help. Despite following the advice of several veterinarians and administering many medications, we were unable to get the issues under control and managed. Through the advice of Dr. Schell and the use of the EQ Total Support combined with the EQ Immune & Repair, we were able to get the respiratory issues controlled, and in less than 30 days I was back to riding a horse who had previously been given zero chance to recover. 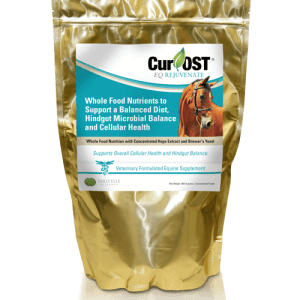 This program has been a life changer for my horse and I will never be without the Cur-OST products in my barn! Long story short, easy keeper mare with cresty neck and fat pads and had mild colic issues in the past. Tested negative for cushings & IR so suspected leaky gut. Started limping on front right so suspected soft tissue issue or founder (based on body condition). xray showed less than 1 degree rotation. Started EQ Total and limping gone in 2 days. It’s been a month and she is totally sound and I’m riding her again. Cresty neck and fad pads are noticeably decreased and breaking down. Eyes are bright and she is willing to work and happy. I’m extremely pleased with the results. Thank you Dr. Schell for your products and for your commitment to educating others. Your articles are fascinating and very much appreciated! He was 6 months into symptoms of high fever with a respiratory rate in the 50’s before I heard about CurOst. It was too late for Hank, my 18yr QH, suspected of having an internal tumor. So I “parked” that first bag of Total for several months, then decided to try it on my 27 yr Appy for his Recurrent Uveitis, Cushings, allergies and mild upper respiratory symptoms. Along with the addition of the Immune formula, within a week his uveitis came under control and,his allergy symptoms subsided. His winter coat lacked the typical curl seen on a Cushings horse and he shed out more quickly that spring.. He enjoyed a virtual bug-free summer. This spring, at 29, Cappy has contracted EPM (clinically diagnosed by 2 vets). I am hopeful he will overcome this latest addition to his challenges. But I have no doubt that the Total/Immune protocol he is on is keeping him as optimum as is possible!